So far this year I've made loaves of bread for teachers, my grandpa and one of my aunt's. I've also made a spread of cookies: Peanut Butter, Roll out Sugar Cookies, Chocolate Malt Cookies, and Foam Mint Cookies. I made different types of Chocolate Chip Cookies: Chocolate Chip Cherry Cookies, Chocolate Chip Mint Cookies, and Chocolate Chip Espresso Cookies. I made much of the wrapping paper I've used. Mica and I made Wake Up Spray for the teachers. Isaak and I made Peppermint Lip Balm for the teachers. 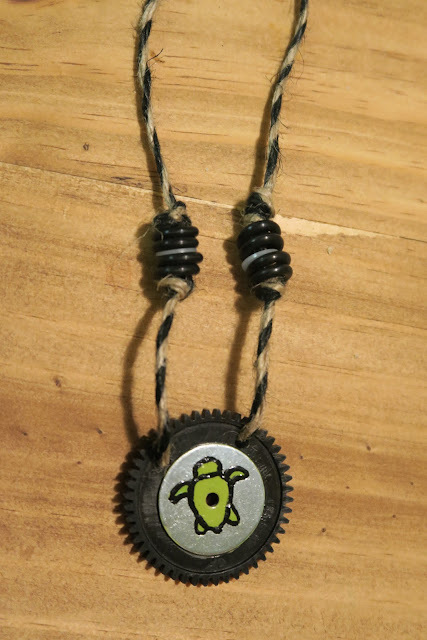 I made a Turtle Washer Necklace for my nephew Evan. What kinds of gifts do you make? I did a Christmas jam (cranberries and strawberries) with mini loaves of homemade bread for the teachers this year. My elderly dad does not care for store bought gifts and prefers my home-baked goods, which I'm happy to make. I go with cookies or candy that is easier to pack and ship. I try to include healthy nuts, or candy nuts for Dad. I haven't made any this year. I have in years past though. I think homemade gifts are way nicer than store bought, in most cases. When I was teaching I always liked the home made things kids gave me at Christmas the best. Honestly I am not all that crafty. The only thing I can really make is slime out of Borax LOL. I need to get better about this kind of stuff. Wow, you've been really productive in the gift area! Actually, the majority of my gifts will be homemade this year for the first time - or the first since childhood. Among others I'm giving homesewn PJ pants. You have been busy, busy, busy. I haven't made a thing this year.